Now there is probably a few of you (possibly most of you) who are wondering who Mr Benn is. He’s a character from my childhood and appears in several children’s books, and an animated TV series by the BBC. The animated series is what I remember fondly. As a quick synopsis, each episode follows a similar pattern. Mr Benn leaves his house and visits a fancy-dress costume shop where he is invited by the shopkeeper to try on a particular outfit. He leaves the shop through a door in the changing room and enters a world relevant to his costume, where he has an adventure (which usually contains a moral). The shopkeeper then reappears to take him back to the changing room, and the story ends. Mr Benn returns to his normal life, but is left with a small souvenir of his adventure. In this episode, Mr Benn is invited by the shopkeeper to try on an outfit which is a dark blue uniform with a peaked cap – Mr Benn doesn’t know what the outfit is but tries it on and steps, as usual, through the door in the changing room. He is surrounded by plants and the sound of animals, he notices there are cages with animals in them – he then realises that he must be a zoo-keeper. But, something doesn’t feel right. He sees that all the animals look miserable. Following a chat with a friendly and well-spoken parrot, he begins to understand that the animals are so unhappy as all the cages are too small for them. He agrees and comes up with a plan. First, he let’s all the animals out of their cages and gets them to hid in nearby trees and bushes. He then runs through the streets of the town shouting that all the animals in the zoo have escaped. Fear starts to set in, but Mr Benn explains that if all the animals have left the zoo, then the zoo must be the safest place. Driven by their fear the townsfolk rush to the zoo and cram into the small cages. Once inside the cages, the animals then start to appear from their hiding places, and Mr Benn reassures the townsfolk that there is no danger but he wanted to illustrate to them how small the cages were. The people see this and start to build bigger, better cages. In order to understand someone else’s point of view you have to see it from their perspective. 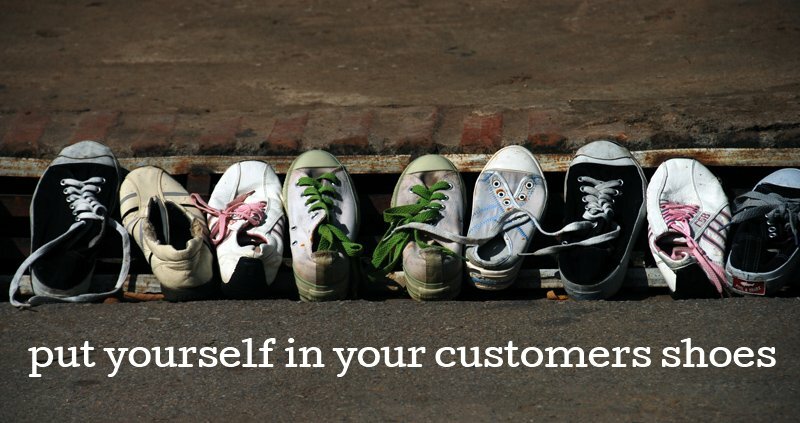 In the world of Customer Experience, this means putting yourself in your customers’ shoes, or as the age-old North American Indian proverb goes “to understand the man, you must first walk a mile in his moccasin”. More often that not, a customer’s perception of your business is the difference between them being a happy, satisfied customer and one who is less than satisfied. walk into one of your stores as a customer – what’s the first impression like? call your business – how do the staff greet customers? Or if it’s an IVR how does this sound? visit a competitor – does this look/feel different? visit any store away from your industry – does this look/feel different? If you start to do this kind of activity you will start to understand how it feels to be a customer of your company, and how you would want it to be if you were a customer. Oh, and in case you’re wondering, the ‘souvenir’ of Mr Benn’s adventure was a bright red feather – a gift from the parrot. @_jase_clarke_ …and as if by magic! Very good Sir!